I’ve been on a losing streak. During two of the last three weekends I’ve gone on back-to-back baking binges that were fueled at least in part by frustration over my failures. I spent the better part of those Saturdays and Sundays baking, failing, getting mad about it, baking something else, failing, repeat. The only thing that stopped me from doing the same this past weekend was driving to Wisconsin with my husband and dog. So when I successfully made gingerbread cookies for the first time last week, although a bit overbaked, it felt like a blessing from the dessert gods. Before I get into the gingerbread cookies, let me give some context to exactly how sweet this “victory” felt. This whole extravaganza started three weeks ago when, in an effort to get into the holiday baking spirit, I wanted to make Linzer cookies with homemade cranberry-raspberry jam (because store-bought jam wasn’t good enough for my optimistic standards). Here’s the thing about me and jam: I sort-of made a strawberry jam once to fill strawberry shortcake cupcakes a few years ago. I don’t recall there being much to the process and it tasted pretty good. So according to three-weeks-ago Liz, that made me a jam master. Recipes be damned! 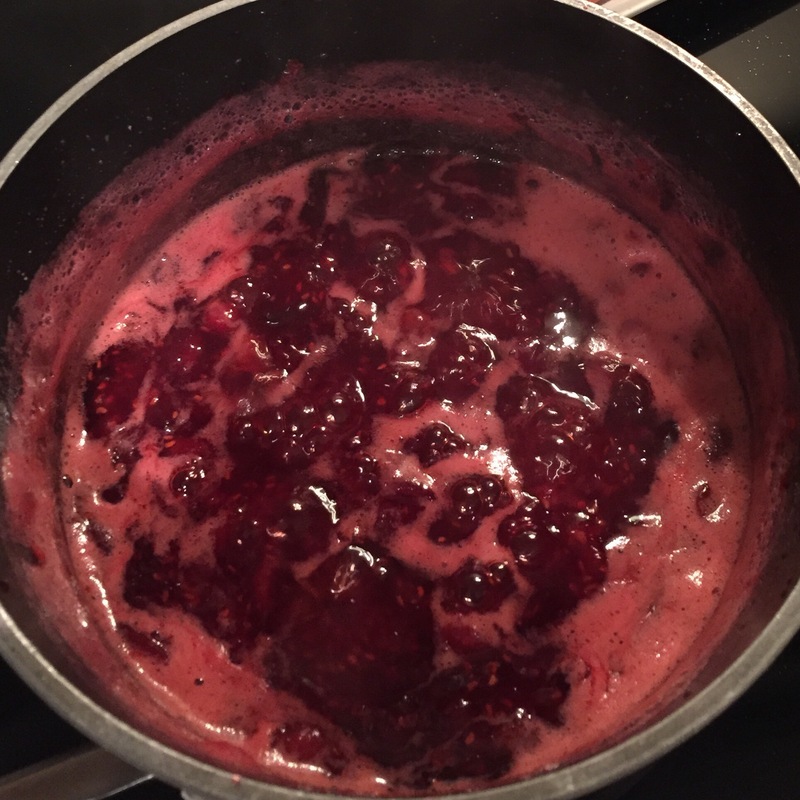 I threw cranberries, raspberries, sugar and water into a pot and turned up the heat. Then I spooned out some water. (Will that make it too thin?) Then I added more sugar and water. (Nah, stick with your gut, Liz.) But then I changed my mind and spooned out even more water. (What were you thinking?!) And that’s when it started bubbling and popping like crazy, sending globs of boiling hot sticky mess all over my stove, counter, refrigerator, microwave, and floor before I could grab my splatter screen. (Should jam bubble like that? Don’t Google the answer, Liz – you’re a jam natural!) Finally, when I either determined the consistency was right or simply gave up, I took the pot off the stove and pressed the red goop through my flour sifter, after discovering my fine mesh sieve was too fine. This resulted in an even bigger mess (because it’s a flour sifter, not goop seed extractor) as well as a somewhat delicious cranberry-raspberry mixture with questionable consistency. Then I got started on the Linzer cookies themselves, which I had never made before. I chilled my dough in the refrigerator as directed to make it the right consistency for rolling and cutting out shapes. When I rolled out the cold dough, sure enough, it had a great consistency…for about 3 minutes. And then it immediately melted into an amorphous sticky blob that absolutely would not hold its shape. I tried a number of techniques to try to save my obviously faulty dough, like sticking it in the freezer, or scraping out the shapes on plastic wrap and flipping them onto the cookie sheet. It took me more than a full hour to get 12 cut outs onto the cookie sheet. Unwilling to soldier on with this ridiculous exercise and accepting that I screwed up the dough beyond repair, I popped the 12 cookies into the oven just to see how they’d turn out. The answer: unevenly burnt. 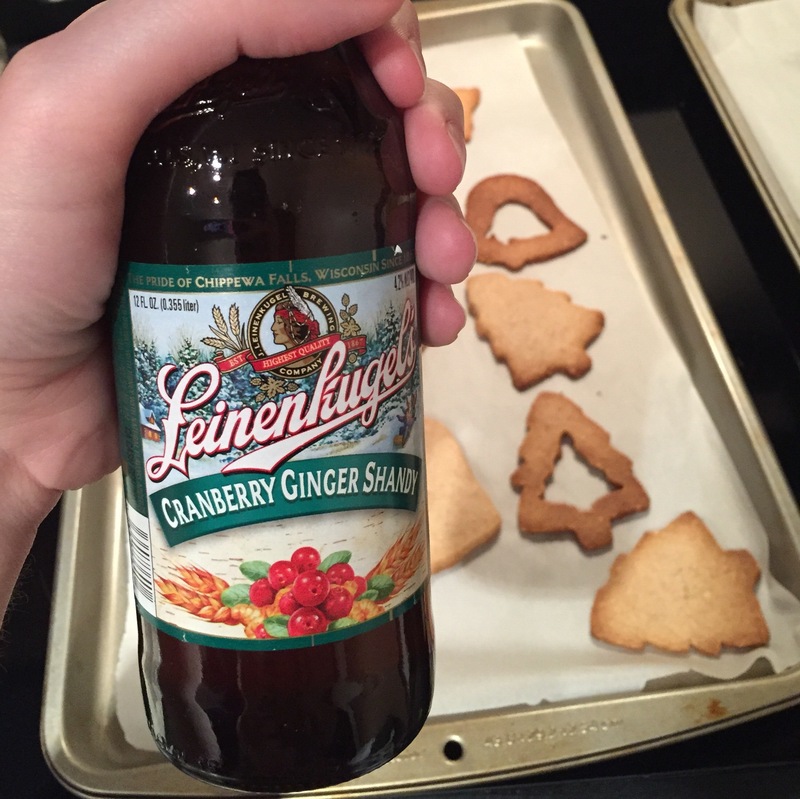 I wasn’t going to be getting holiday cheer from Linzer cookies anytime soon, so I turned to other means. But wait! Perhaps the problem with my Linzer cookies had something to do with my unusually warm kitchen? You know what loves warm kitchens? Yeast breads! If I could make a good yeast bread, which I have before, maybe I would feel like all my work was not for nothing! Clearly I made a mistake by using one of my David Copperfield mixing bowls in this situation. I switched the dough to a glass mixing bowl and propped the oven door open. Ah-ha! There was life in the yeast because it started to rise…well, a little bit anyway. Enough that I was willing to move forward even if my rolls wouldn’t be quite right. I cut the dough into pieces, laid them into cake pans in a pattern matching the picture in the recipe book, and set them in the fridge to rise overnight. In the morning I walked straight out of my bedroom into the kitchen. I was hungry and ready to bake! But the stupid blobs looked exactly the same coming out of the fridge as they did going in. I was furious. Fortunately I had another trick up my sleeve to make me feel better: ice cream. After many rounds of making pudding from scratch, I found ice cream came easily to me, and trying out a new flavor – mint chip – was bound to be simple as pie (Good thing I didn’t try to make a pie that weekend…). And it was! Except the part where I forgot to set the mint leaves in water to prevent wilting overnight, and I made a poor judgement call that wilted mint leaves wouldn’t make a difference in ice cream. Guess what? It tasted like wilted mint leaves. I didn’t bother to churn it. My weekend ended with nothing but red goop and a batch of chocolate chip cookies that turned out fine because they’re chocolate chip cookies – you don’t even have to bake them to enjoy them. I started with the gingerbread dough, which was simple enough. 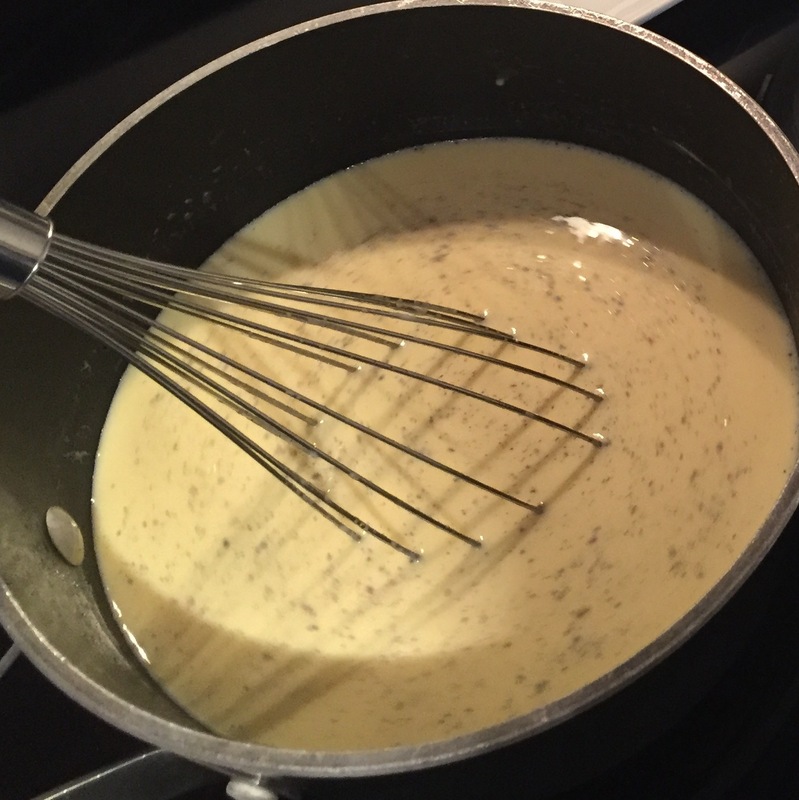 The only complication was that the recipe called for creaming butter, white sugar and brown sugar until you could rub a bit between your fingers and it wouldn’t feel gritty. Well, that never happened, and after 15 minutes of beating with my mixer I decided to pull the “good enough” card and move on. Then I stuck the dough in the fridge to cool and harden into a workable consistency. Sound familiar? Yeah, I was already nervous. 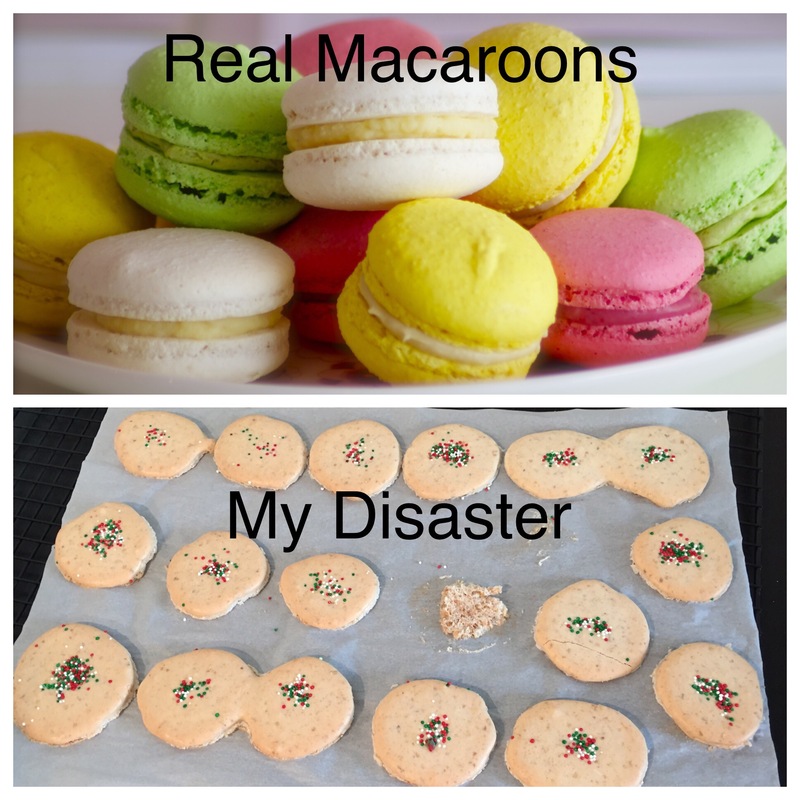 I needed to pass the time, but rather than clean up the kitchen and relax for a bit, I had a certifiably insane idea: I should also make macaroons for the holiday party! Why is this idea so insane? It wasn’t just because of my repeated failures, or the fact that I should maybe chill out on baking for a while until I get my groove back. It’s because macaroons are a signature Parisian treat, and if you know anything about French baking…let’s just say it’s not chocolate chip cookies. And more importantly, when you’re an amateur on a losing streak, you don’t challenge LeBron James to a one-on-one game. Taking another bite of chocolate chip cookie and letting the false sense of baking confidence wash over me, I thought to myself, I’m going to blow people’s minds with some colorful macaroons. And you guessed it – I failed spectacularly. There was still some hope for my baking that weekend, even if I was doubting my ability to bake anything other than chocolate chip cookies ever again. My gingerbread dough was in the fridge and ready to go. My oven was off and cool, and the temperature in my apartment was turned down. 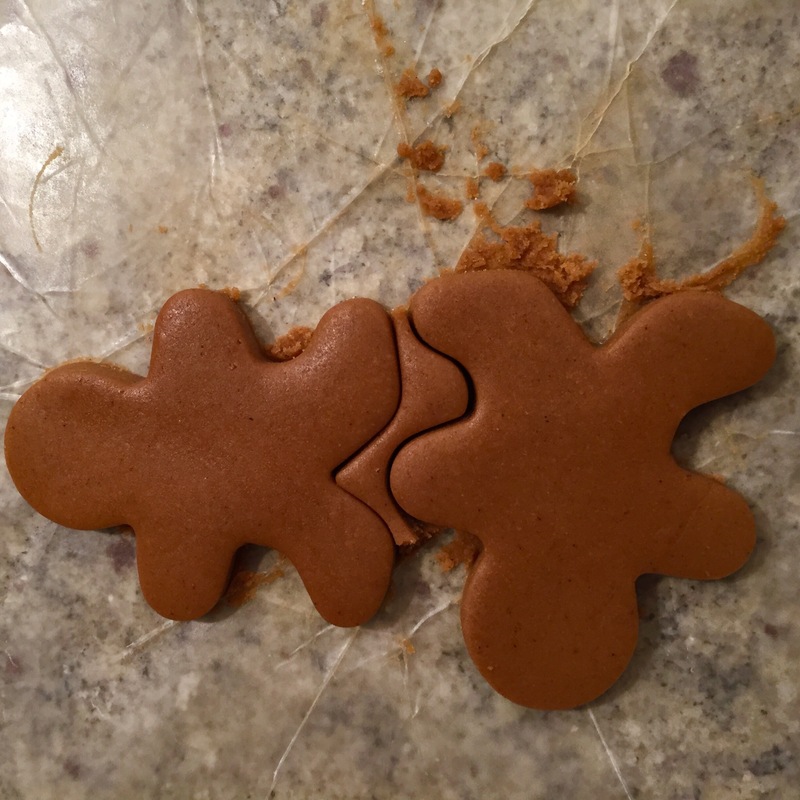 Maybe, just maybe, I could make some gingerbread people without the remaining pieces of sanity crumbling to dust. I laid out some wax paper and lightly floured the bottom. Then I pulled the dough out and flattened it with my rolling pin between the pieces of wax paper. So far so good. Then I cut shapes with my cookie cutter. The dough scraps around it pulled away with no problem. This is already far unlike my Linzer cookie experience. Now for the real test: could I move the shapes to my cookie sheet and maintain their shape? YES!!! 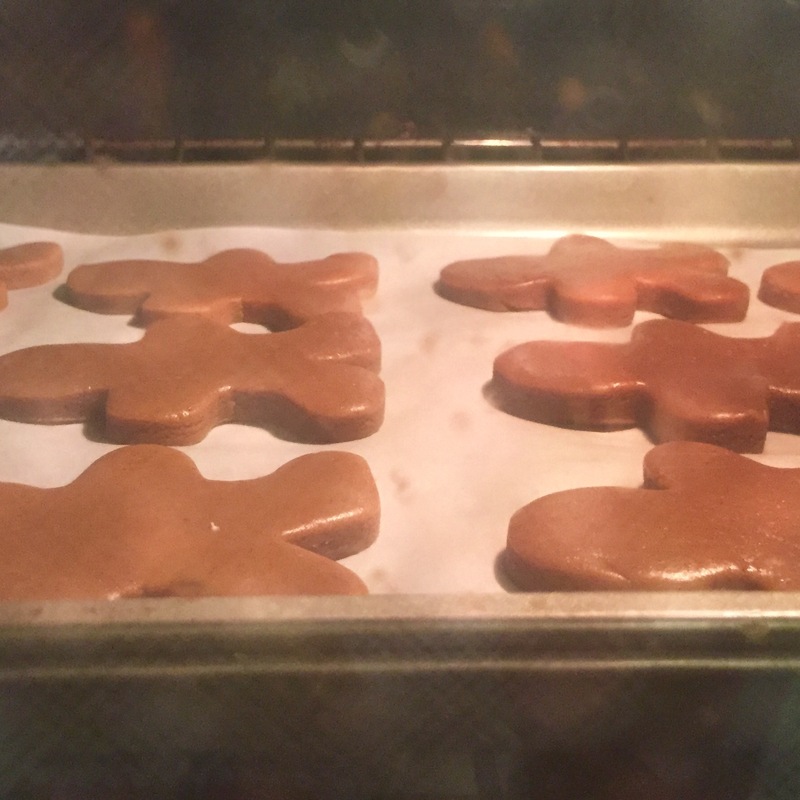 Look at those cookies, all sitting on a cookie sheet like they were never anywhere else! I was a cookie dough rolling, cutting and transferring champion! I started re-rolling the scraps to make more cookies without refrigerating in between. Heck, I even took some of the odd looking cookies already on the cookie sheet and re-rolled them. Who does something like that? Someone with gingerbread dough balls of steel does that! I popped them into the oven and waited. The recommended oven time was very short, and while they quickly started to look baked, the bottoms didn’t brown up the way I’d expected. I kept them in there longer. And longer. A few ended up burning and the rest were probably harder than they should be, but still plenty edible and delicious. After all the failure I’d been through, I was ready to chalk up the over-baking as a “learning experience” and move on! The next step was to make royal icing for decorating, which much like chilling and rolling out the dough, made me nervous. Granted I’ve made royal icing before and there truly isn’t much to it. I just didn’t have a great feeling about going through the same steps again that led to those disastrous macaroons. 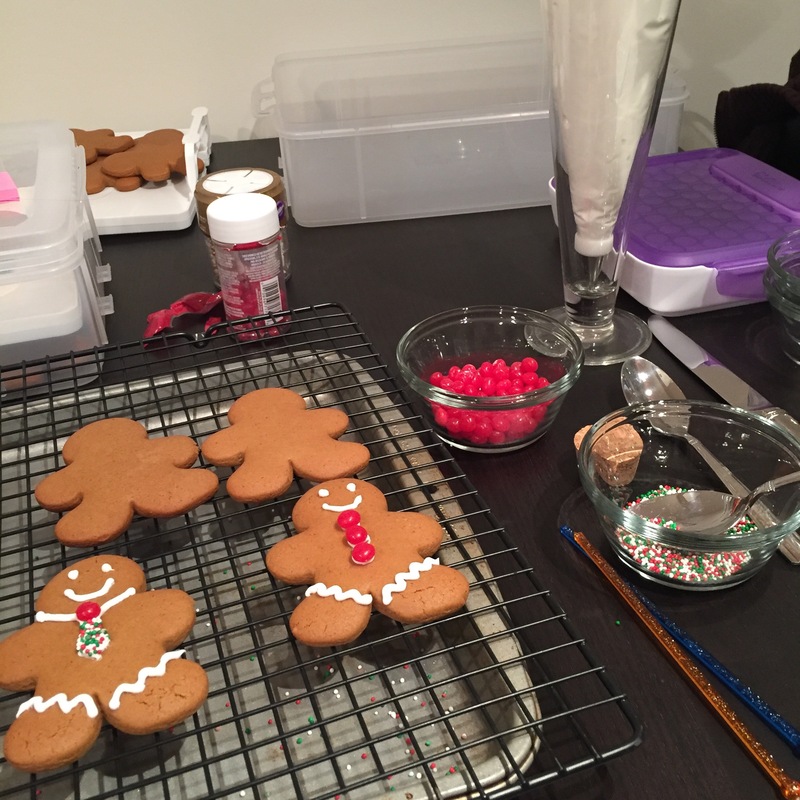 The frosting turned out fine, and in no time I was cranking out cutesy gingerbread people. What did I learn from all of this? I learned that spending every waking hour in the kitchen is an exhausting way to spend your weekend and won’t necessarily fix your baking failure streak. It either helped me speed through to the part where I get my groove back, or made it worse by not waiting it out until I have my energy back. However, I also think I learned to apply more of the baking instinct I’ve been developing when trying new recipes. If I hadn’t added a light coat of flour to my work surface when making my gingerbread cookies, I’m not sure I would have been as successful. For now, I thinking I’m going try to keep my baking to a more reasonable level until I’m back in my groove. On to the next adventure! 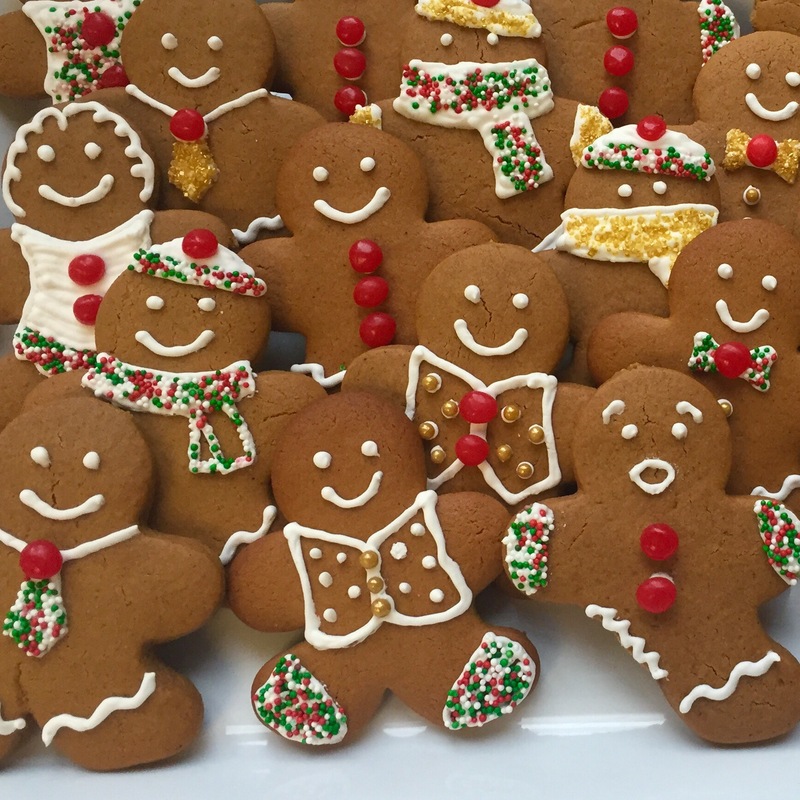 Gingerbread Recipe: Williams-Sonoma Gingerbread People. Next time I would play with the spices more, like adding nutmeg, and trust that they’re done around the 8-10 minute mark so they stay softer (mine were quite tough). I also used a little flour to help me roll out the dough and keep it from sticking to the wax paper. 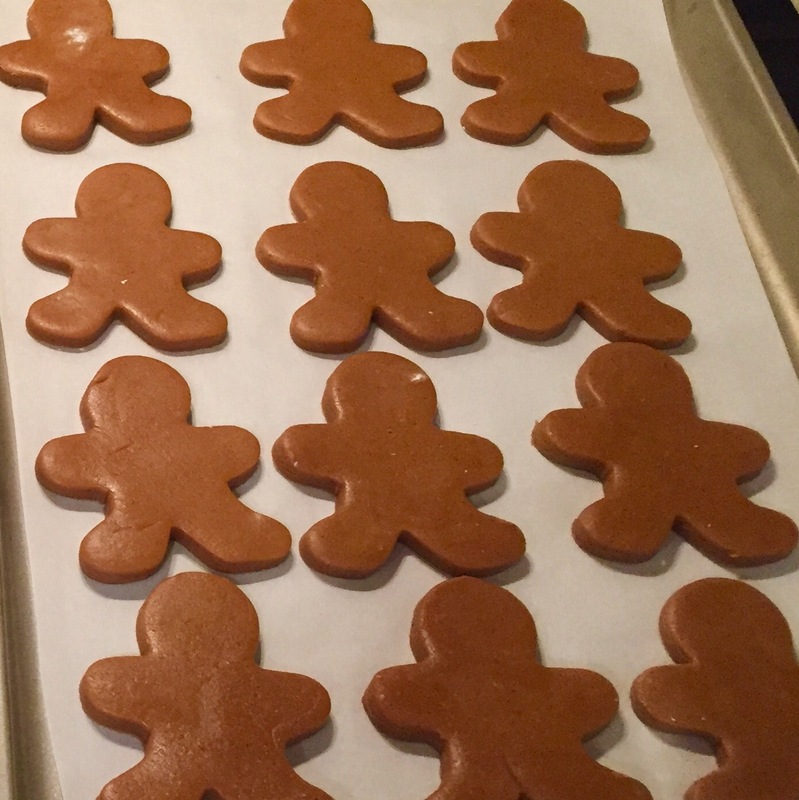 Royal Icing Recipe: Williams-Sonoma Royal Icing. Mine didn’t have salt or vanilla in it (the recipe in my book didn’t include them) but I think that would’ve helped the flavor significantly – especially since I’ve now expressed my feelings on frosting. Sprinkles: Red hot candies (which taste so good with gingerbread!) and other sprinkle mixes I purchased at Sur La Table and my grocery store.